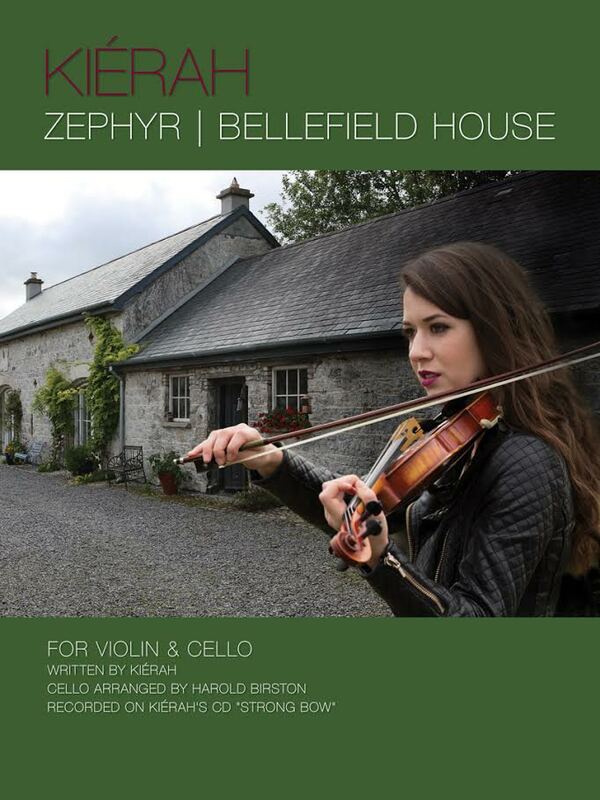 The “Zephyr/Bellefield House” sheet music is made up of a jig and slow reel written by Kiérah which was beautifully arranged as a duet for fiddle and cello by Harold Birston. It also includes the chording for guitar or piano accompaniment. Zephyr/Bellefield House is the tenth track recorded on Kiérah’s album “Strong Bow”, which can be heard or purchased through iTunes or CD Baby. The sheet music is printed on high quality Satin paper, 9″ x 13″. The cover photograph is of the “Bellefield House”, a country home in Shinrone, County Offaly, Ireland where Kiérah’s great grandparents worked and met in 1894. Sam and Jane Flannery were married in 1895 and had six children. In 1906 they immigrated to Canada on a ship called the “Empress of Ireland”, and went on to have six more children. Kierah’s grandfather was the youngest in the family as Kiérah is also the youngest of 7 children in her family. This set of tunes is dear to Kiérah’s heart and she hopes you will love playing these tunes as well!